I bought a new pair of sandals last week, which is something I've been wanting to do for a long time. I couldn't find a pair I liked though, mostly because I wanted sandals that looked sturdy enough for all the walking I do, but all the ones I found in stores like Wal-Mart and Payless looked much too flimsy. So I kept putting it off, schlepping around in my old pair even though they were almost falling apart. I wasn't about to spend money on a new pair that wouldn't last, even if they didn't cost much. Then last week we went into a new store. One where the shoes are anything but cheap, but they're sturdy looking and oh, so comfortable. I found several pairs of shoes I'd have been happy to buy, which is rare for me. I've always hated buying shoes because I'd much rather spend the money on fabric or books. But this store had shoes that are exactly what I've been looking for, meaning that they don't look like they're going to disintegrate after I wear them for a week. I didn't mind paying the higher price because I'm pretty sure these sandals are going to last me a few summers. I think the sandals are worth the price I paid. Did you know that a price was paid for us? The Bible says, "Do you not know that your bodies are temples of the Holy Spirit, who is in you, whom you have received from God? You are not your own; you were bought at a price" (1 Corinthians 6:19,20). These verses are part of a passage speaking against sexual immorality, but the fact remains that we were bought at a price. Paul repeats it in chapter 7 when he says, "You were bought at a price; do not become slaves of human beings (1 Corinthians 7:23). Obviously God did not pay money for us, so what price does Paul mean? One very well-known verse provides the answer: "For God so loved the world that He gave His only begotten Son, that whoever believes in Him should not perish but have everlasting life" (John 3:16). God's only Son, Jesus, is the price that was paid for us. Jesus, who is God, left Heaven and became a human baby who had to be tended and cared for by a human mother. He grew to be a man and was hated so intensely by the religious leaders that they incited a crowd to demand his death. And what a death he endured - our word excruciating comes from the Latin word meaning to crucify, calling to mind 'a pain like the pain of crucifixion'. Yet, "for the joy set before him he endured the cross, scorning its shame, and sat down at the right hand of the throne of God" (Hebrew 12:2). What joy is it that was set before Him? Our salvation, our right to eternal life because of our faith in Him who paid the price for our sins. Jesus endured the terrible agony of the cross because it was the price required to pay for our sins. Think about what a high price that was. Think not only about the physical pain, but also the emotional pain of being hated, mocked, misunderstood and abandoned even by friends. Think about the spiritual pain that made Him cry "out in a loud voice, “Eli, Eli, lema sabachthani?” (which means “My God, my God, why have you forsaken me?”)" (Matthew 27:46). Try to imagine all of that bombarding Him at one time. Jesus endured all of it because He thinks we are worth the price He paid. Let this thought settle into your heart this week: whether or not you feel worthy, Jesus thinks you are worth the price He paid. Finally I can share pictures of my Scrappy Log Cabin quilt! I finished it back in May, but this quilt is huge and I don't have anywhere to take pictures of something so big easily. No quilt-hanging-on-the-backyard-clothesline shot for me. So, we took it to a local park for a special photo shoot. 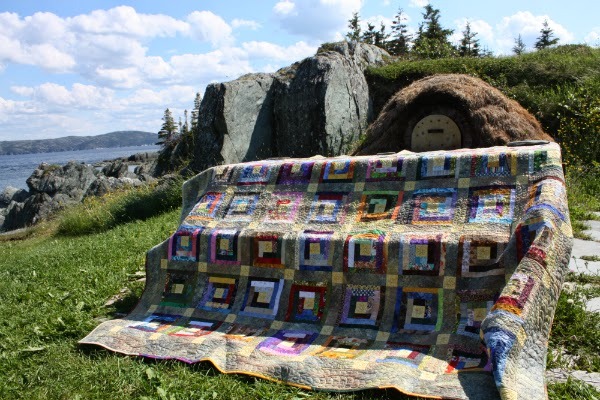 That rather odd looking structure behind the quilt is a reproduction of a community bread oven from the time of the early French settlers in this area. 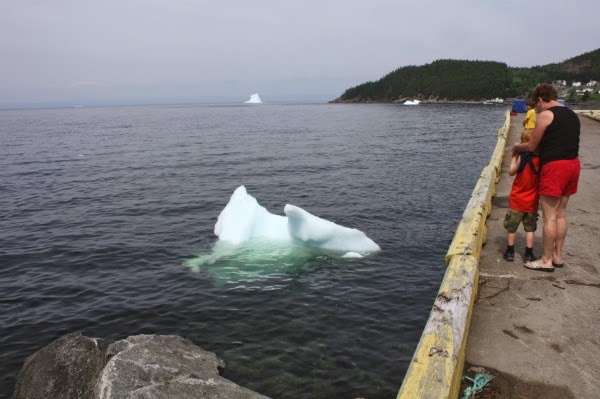 There are still lots of icebergs around, as you can see in the background. All the fabrics in the quilt top are scraps, except for the sashing/borders and the yellow in the block centers and sashing cornerstones. 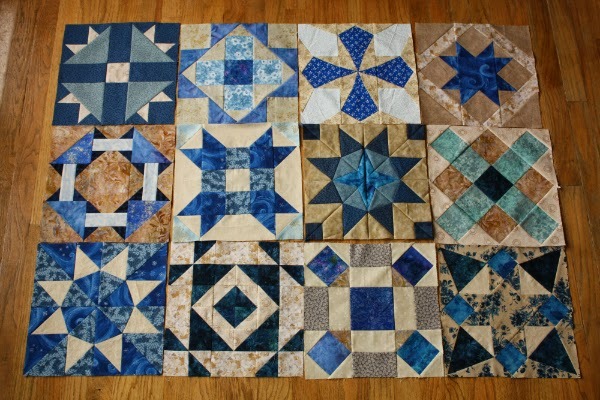 Amazingly, my 1 1/2" strip container is still just as full as when I started piecing this. Do the scraps breed when we're not looking? It took me a long time to quilt this, mostly because I kept starting (and finishing) other projects instead of working steadily on this one. It actually took about 16 months to finish just the quilting. 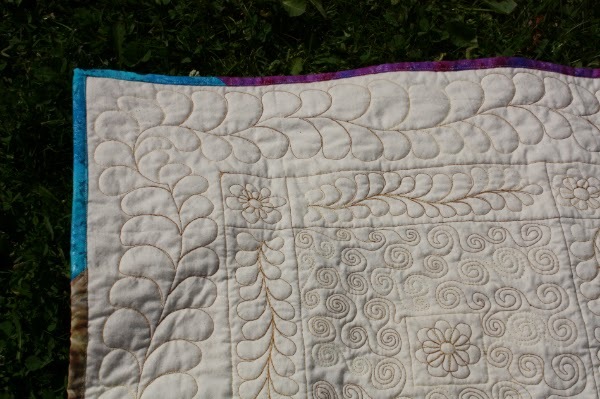 The whole reason I started making this quilt, way back when, was to give myself a large project on which I could practice my free-motion quilting skills and it worked! I started by stitching in the ditch around all the blocks and then I made the first attempt at a block. I hated it! There's not a line in there that's even close to straight, and I wasn't going for the organic look. I wasn't about to rip out all those stitches, but there was no way I was committing to doing 55 more blocks with a design that I hated. Eventually I settled on spirals in all the blocks, except in each vertical row there would be one block with a different design. That way this first block wouldn't be the only odd one out and I could play around with a few other designs along the way. Whew, crisis averted! Some of these pictures are from the back of the quilt so the quilting shows up better. Here are my favourites of the different designs. As for the spirals, did they ever improve between the first blocks and the last ones! One of the last spiral blocks. 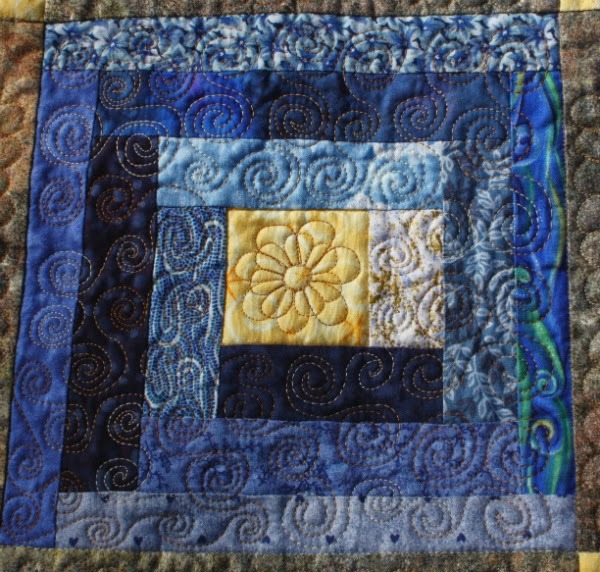 Don't you just love when you can see that your quilting has improved? I decided the sashing strips would be a great place to work on my feathers. After all, with something like 127 sashing strips, I was sure to figure out how to stitch them by the time I finished, right? I also did feathers in the border. Because this quilt is so big, it's hard to get a good shot of the back that shows all the detail of the quilting. I used a Gutermann 100% cotton variegated thread for the quilting, but I won't be buying it again. It produced a crazy amount of lint and I had problems with breakage at times. I do love how it blends in with the mottled sashing/border fabric though. When the quilting was finally finished, I dug out my 2 1/2" strips and pieced a scrappy binding. Then I did the binding entirely by machine, figuring that a practice quilt seemed an appropriate place to practice that new skill too. As a bonus, machine binding is lots faster than hand binding. This quilt is now covering the bed in our spare room, making me happy each time I see it. I'll be celebrating by linking up everywhere I can think of! Check out my links page. It's finally my turn to introduce myself for the 2014 New Quilt Blogger Blog Hop, and on my birthday too! It's so nice of you to drop in to help me celebrate. Too bad we can't share cake through our computers. A huge thank you goes to Beth of Plum and June who has put so much into giving us new bloggers the chance to introduce ourselves. There certainly are a lot of us and it has been so much fun meeting new people these past few weeks. 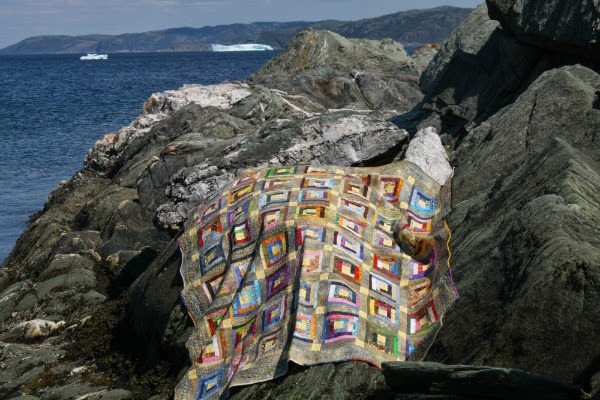 My name is Leanne and I've been quilting since the start of 1997 (17 years!). My mom gave me a quilting magazine as part of my Christmas gift and taught me what I needed to know to make my first quilt as a wedding gift for a friend. 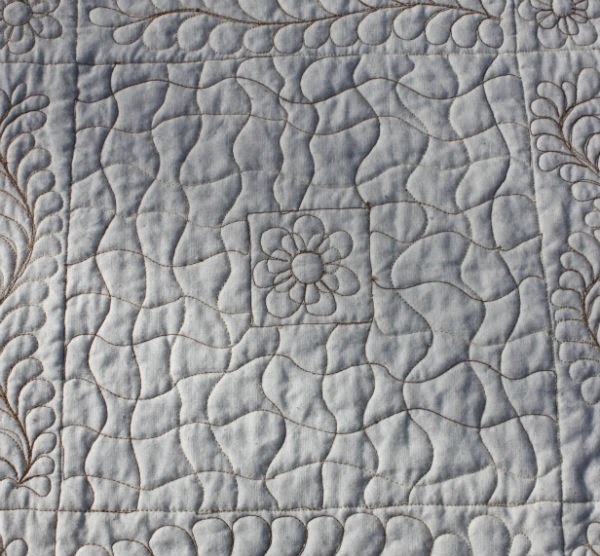 It was almost double bed size and featured hand applique, hand embroidery and hand quilting. Unfortunately, I don't have any idea where I could find pictures of it right now, but I do know it had horrible ripples on the back, because I didn't baste it enough, and the binding was a total mess. But it was my first quilt and I was incredibly proud of it! Since then I've learned a lot. Here are some of my most recent finishes. My Spin placemats, one of three patterns available in my Craftsy pattern store. It took me a long time to realize I could design my own quilts rather than following someone else's pattern, but now I'm having fun playing with designs. My Scrappy Log Cabin, which took me a ridiculously long time to finish, but I'm so happy that it is finally done and I can see it every day when I look in at the bed in our spare room. I haven't posted about this one yet but, as you can see, I finally got pictures so it will get a post of its own soon. My Schnitzel and Boo Mini Quilt Swap quilt, which is my absolute favourite of all the quilts I've ever made. I feel like with this quilt I can comfortably say my free motion skills have progressed from beginner level to intermediate level. Still far from perfect, but I love what I'm able to add to a quilt now with the free motion work and I'm no longer terrified that I'll ruin a quilt top by trying to fmq it. 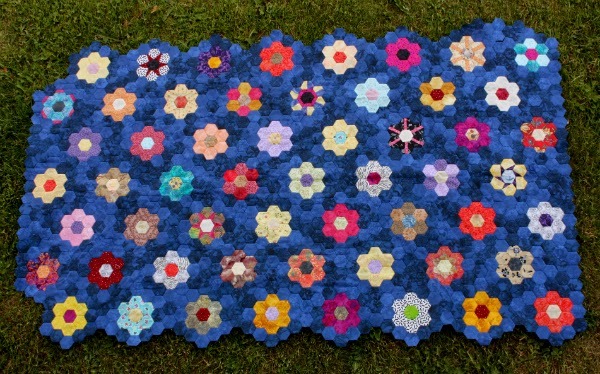 And here is one of my many, many works in progress, my epp hexie flower quilt. I'll soon be finished the top, since I only have to fill in the rest of the edges so that they will be straight. Then I get to figure out how I want to quilt it. After piecing the whole thing by hand it seems a shame to machine quilt it, but I know hand quilting would take me f-o-r-e-v-e-r. I know this because I have one quilt that took me six years to finish! 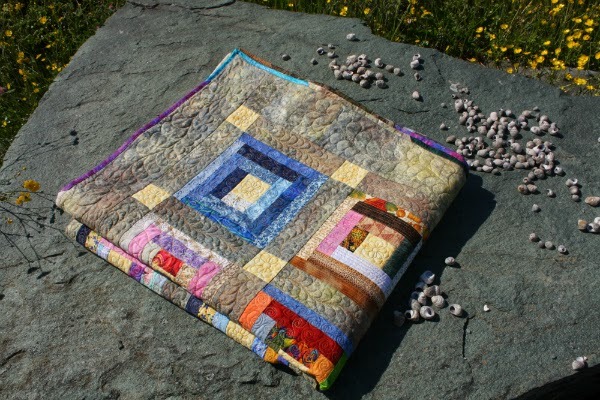 My blog's name, Devoted Quilter, is actually the result of me playing with words a little. 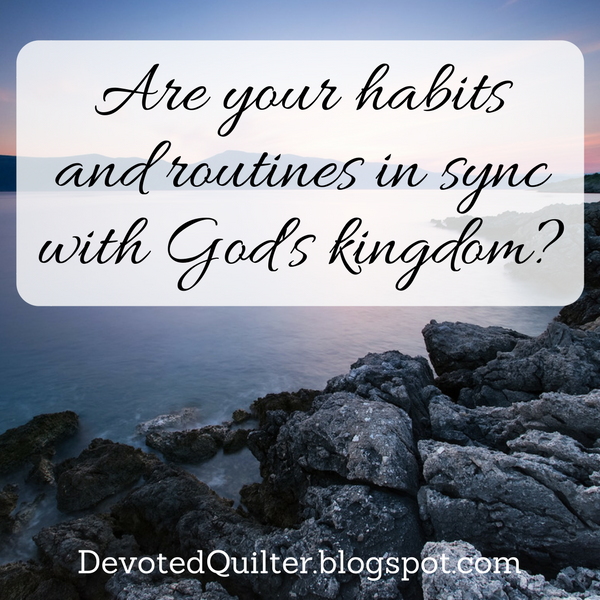 Yes, I am a devoted quilter, but I also post a Christian devotion on Mondays. These devotions are snippets of how I see my faith relating to everyday life. Sometimes the devotion relates to quilting, but it could also be about anything from our family vacation to the Olympics. You can see all the devotions I've shared here. 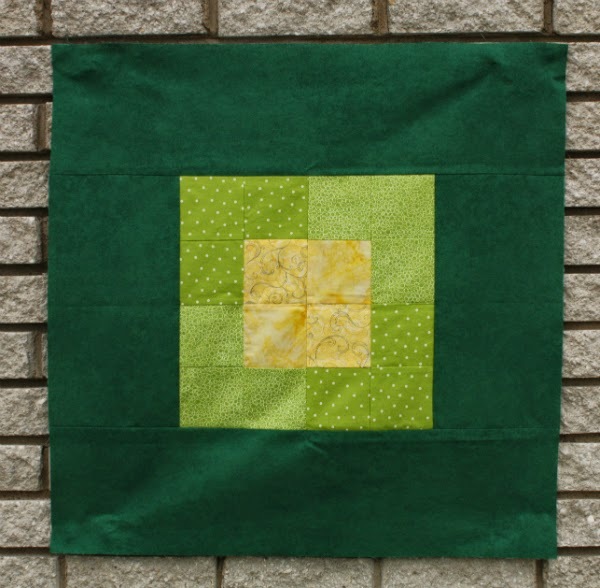 As part of the blog hop, we were each asked to post a blogging tip and a quilting tip. I have two tips and they could both be applied equally to either blogging or quilting. First of all, if you don't know how to do something, don't be afraid to ask for help! 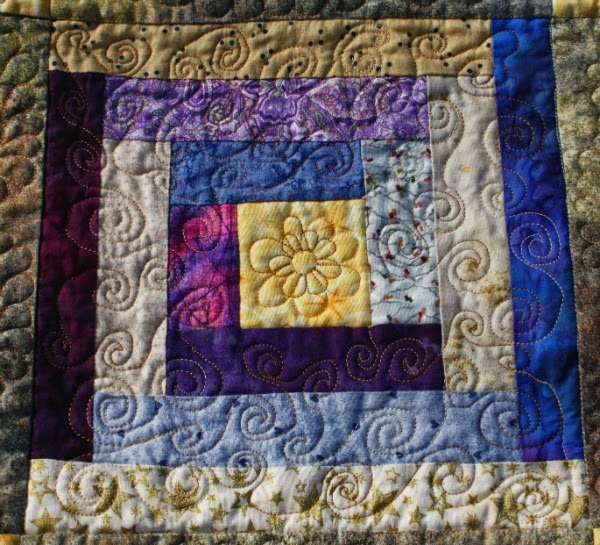 Quilters, and quilt bloggers, are a generous bunch and will do whatever they can to help you master a new skill. Second, don't get stuck thinking that the way you've always done things is the way you have to do them. 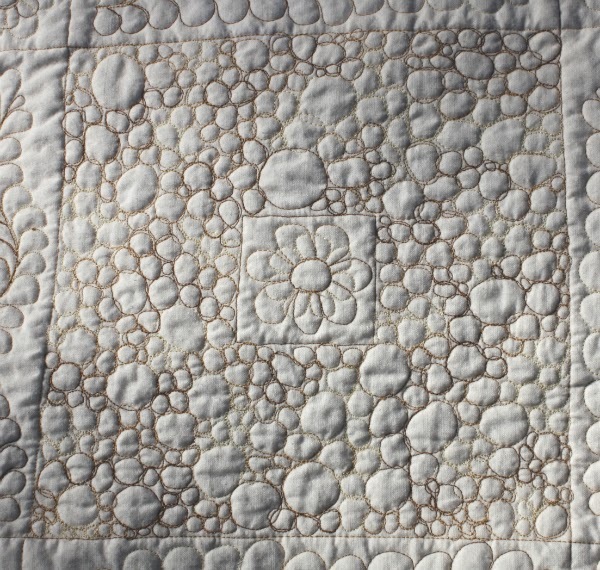 I started out hand quilting everything, and thinking that machine quilting was somehow cheating. But I wanted to give quilts as gifts far more often than I could if I spent years hand quilting each one, so I gave in and tried machine quilting. Now I can't imagine why I resisted for so long! 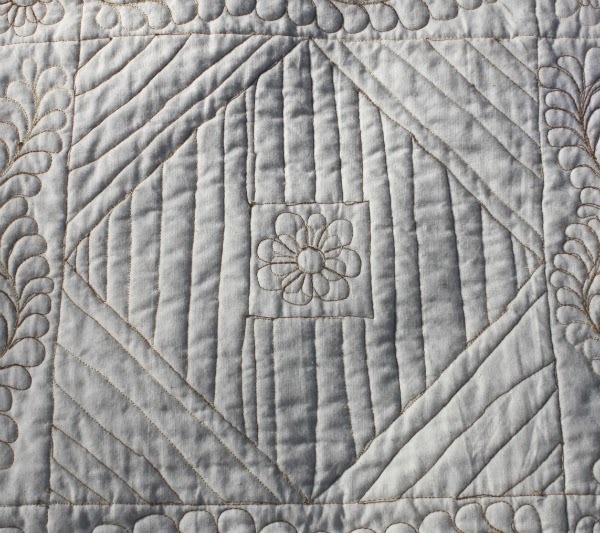 I love machine quilting and the level of detail I can do and still finish quilts in a reasonable time frame (well, except for my scrappy log cabin). So don't be afraid to branch out and try a new way of doing something. It may become your new favourite. 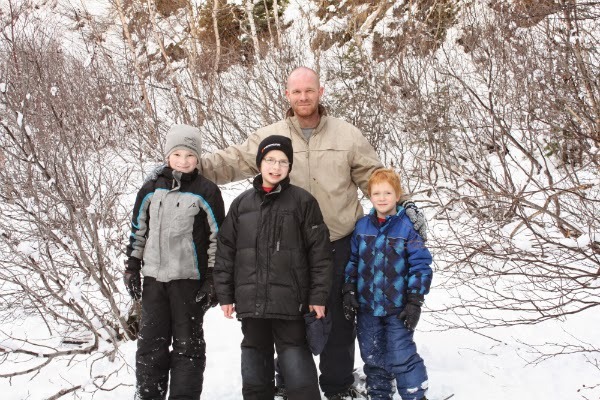 For some non-quilty information about me, my husband Paul and I will celebrate our 15th anniversary in a couple of weeks and we have three great boys. Aiden is 12, Zachary is 10 and Nathan is 6. 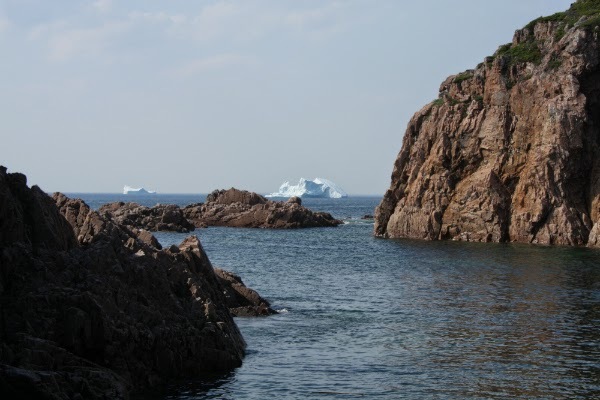 I love the ocean and I've lived close to it all my life, in Nova Scotia, Nunavut and now here in Newfoundland. I also love to read, especially fantasy like Robert Jordan's Wheel of Time series, George R. R. Martin's A Song of Ice and Fire or Brandon Sanderson's The Stormlight Archive. I also enjoy Karen Kingsbury, Kristen Heitzmann and the Love Finds You series. What do you like to read? Any favourite authors I should try? I'm slowly getting into gardening. So far we have strawberries and this year I added a patch of green beans. I don't really know what I'm doing, so I'm just figuring things out as I go along. Our growing season is pretty short, but I'm enjoying seeing things sprout and grow. I've been a part of the quilt blogging community for almost a year and a half and it has been a wonderful experience. Thank you to everyone who follows my blog, or follows me on instagram (I'm @devotedquilter). It's so much fun to get feedback on the things I'm working on and to make friends with quilters all around the world. Now that you know a little about me, here's a list of the other participants in the blog hop today. I know they'd all love to hear from you too. Thanks for stopping by and have fun visiting everyone else! 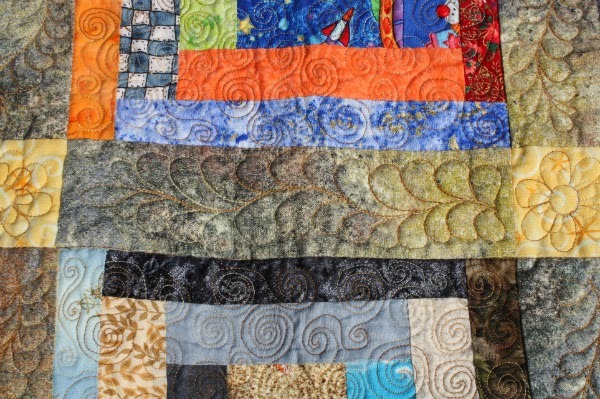 What prompted you to start quilting? 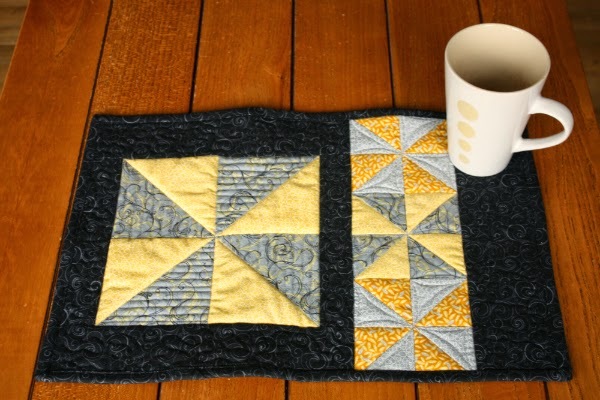 During the New Quilt Blogger Blog Hop I've read lots of different reasons, ranging from 'my mom taught me as a kid' to 'my dog chewed up his blanket and I thought I could make him a new one'. I started because I saw a quilt magazine in a store one day and decided I wanted to make a quilt. When I told my mom about my interest later, she picked up a magazine for me as part of my Christmas gift. 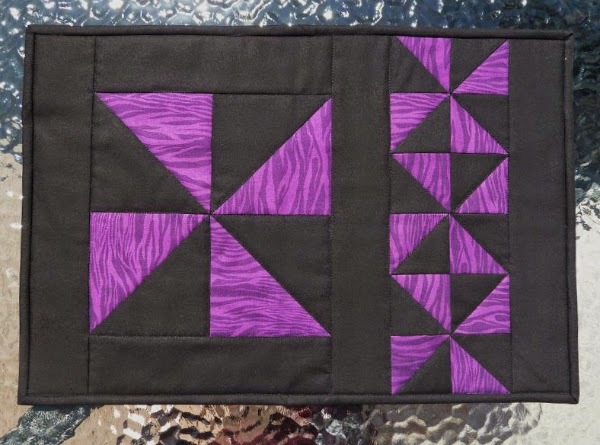 Though the initial prompts were different, something about quilting struck your interest and mine and captured our attention enough that we decided to invest both our time and money in this hobby. And am I ever glad Mom bought me that first magazine! What prompted you to believe that Jesus is real, that He lived and died to offer salvation to any who believe? I've heard of people who believed after listening to a certain song, or who talked with a friend who explained the gospel at just the right moment. For me, it was a combination of listening to conversations among my husband's family and listening to radio broadcasts by Focus on the Family and Insight for Living. The Bible records many people who came to believe in Jesus as the Messiah while He still walked the earth, and of many more who came to believe after He had ascended into Heaven after His resurrection. John 2:11 - "This, the first of his signs, Jesus did at Cana in Galilee, and manifested his glory. And his disciples believed in him." John 10:40-42 - "Then Jesus went back across the Jordan to the place where John had been baptizing in the early days. There he stayed, and many people came to him. They said, “Though John never performed a sign, all that John said about this man was true.” And in that place many believed in Jesus." John 4:39-42 - "Many of the Samaritans from that town believed in him because of the woman’s testimony, “He told me everything I ever did.” So when the Samaritans came to him, they urged him to stay with them, and he stayed two days. And because of his words many more became believers. Acts 2:40, 41 - "And with many other words he [Peter] testified and exhorted them, saying, “Be saved from this perverse generation.” Then those who gladly received his word were baptized; and that day about three thousand souls were added to them." Acts 8: 26-40 - Philip explains a passage of Scripture to an Ethiopian who believes and immediately wants to be baptized. Acts 9:1-18 - Saul, later to be called Paul, is on the road to Damascus, intending to imprison anyone he can find there who worships Jesus. Jesus speaks to Saul, temporarily blinding him and Saul believes and serves Jesus from that moment on. There are many other examples, of course.What I find interesting is that God doesn't have only one way He uses to bring people to Himself. It was true of those people whose stories are recorded in the Bible and it's still true today. God knows each person intimately. He knows how we think and what will capture our interest and attention in a way that will allow us to understand the truth about Jesus and then to believe. This is comforting to me as I think about people I know who have no intention of setting foot inside a church, or of reading a Bible. It's okay. God knows this about them. He knows how to reach them. This doesn't mean that everyone will accept Jesus, of course, much as we wish that it did. It does mean, though, that there is no 'only' way for people to hear the truth and understand it. There are many possibilities and God can use any or all of them as needed to woo those who don't yet believe. My job is not to worry about how He could possibly reach them, but to be available in case His plans include using me in some way. I find it hard to believe I'm sitting here contemplating the projects I hope to finish in the third quarter of this year. I know everyone is saying it, but I'm going to add my voice to the mix - this year is flying by! So, without further ado, here's my list. 1. My Canvas quilt. This is the pattern I tested for Leanne of She Can Quilt, and it's my only unfinished project from last quarter. I started quilting it the other night, trying out my Fine Line Quilter's Rulers and some Essential Pro polyester thread from Connecting Threads. So far I'm liking both. Hopefully this will be a quick finish. 2. Paul bought me a jelly roll of lovely Cantik batiks a few weeks ago. 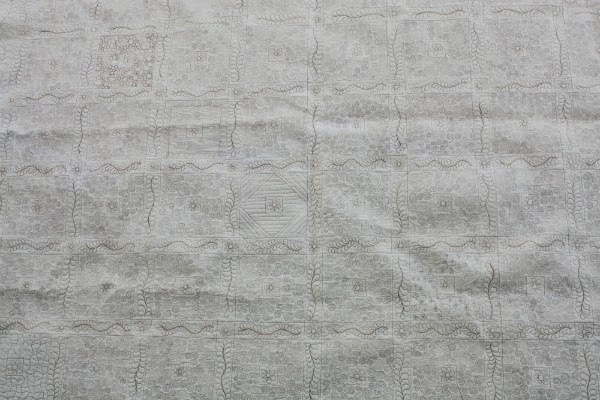 Last week I picked up this pale green print to go with the batiks and my plan is to make myself a new quilt for using in the living room. Right now I'm thinking maybe a rail fence block with the green as sashing, but I haven't settled on that yet. I usually wash all my fabric prior to starting anything, but I don't know about washing those strips...would they get distorted or fray too much? What do you do with your precut strips? 3. I put up a Craft it Forward post a couple of weeks ago so now I have three people awaiting handmade presents from me. I'm listing each one seperately, so number three on my list is my Craft it Forward gift for Shauna. 4. My Craft it Forward gift for Jennifer. 5. My Craft it Forward gift for Gail. 6. A baby quilt for my cousin Jessica, whose first baby is due in December. I'm thinking about combining this with my desire to participate in the Orange Peel QAL being hosted by Jess of Quilty Habit, but I haven't decided for sure yet. 7. 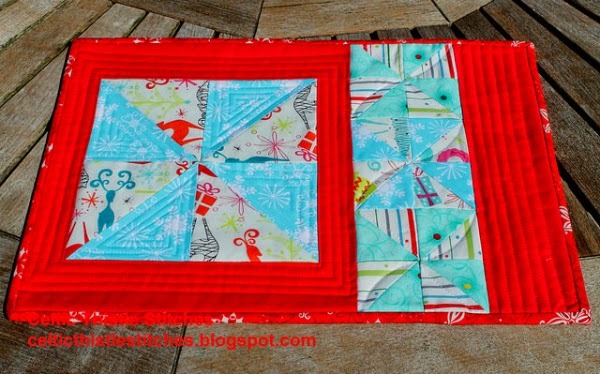 I want to make a version of my Schnitzel and Boo Mini Quilt Swap quilt for us. The fabrics are picked out (though still not ordered), and I know exactly where it will hang when it's finished. 8. And just because I feel like I should have at least one project I'm almost certain will carry over for a couple of quarters, I might as well list my Sugar Block Club 2013 quilt. The blocks are all finished, but that's about as far as my planning has gone. To say finishing this one is a long shot is an understatement, but at least this way I officially have it on my radar. Oh yeah, I may also try to do things like sleeping, taking care of my boys (when they come back from 2 weeks in Nova Scotia with their grandparents) and spending time with Paul. Good thing these Finish-a-Long lists don't come with penalties if you don't finish everything each quarter! If you've been reading my FAL lists for a while, you may have noticed that my Scrappy Log Cabin quilt is not on this list. That's because it is finished! It was actually finished back in May, but I haven't yet had a chance to take good pictures of it, so I haven't posted about it. I'm heading out in a few minutes to try to get those pictures, so I may finally get to share this long awaited finish next week. Whoo hoo! 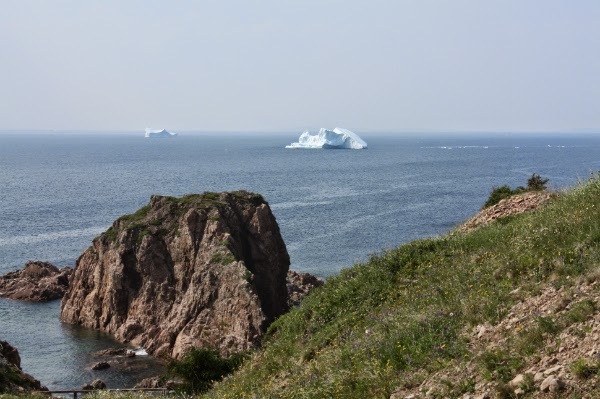 There are lots of big icebergs around Newfoundland this year. This one is actually quite small, but close to shore so we could get a good look at it. Mom helping Nathan take a picture. This little one was really close to shore! We actually got to watch it roll over, which is something I've never seen before except on tv. 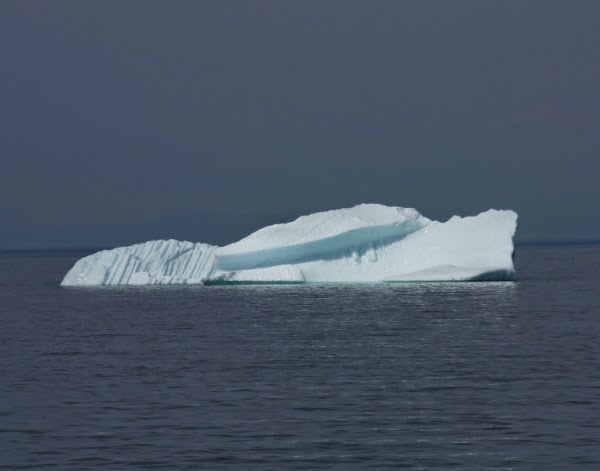 The boys thought the iceberg in the distance looked like the big fin on a submarine. 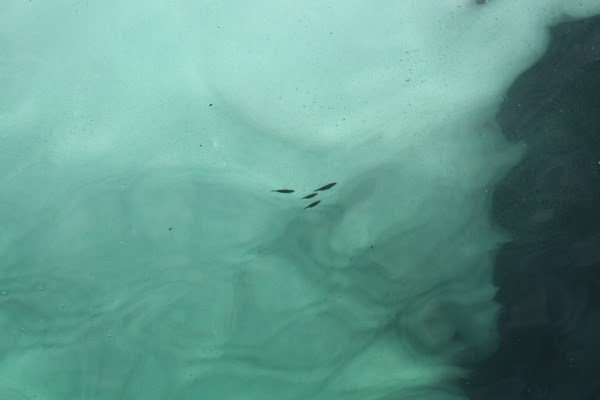 These are tiny fish swimming over the submerged part of the iceberg by the wharf. The bigger of these two was moving fast enough that we could watch it move past the rocks. 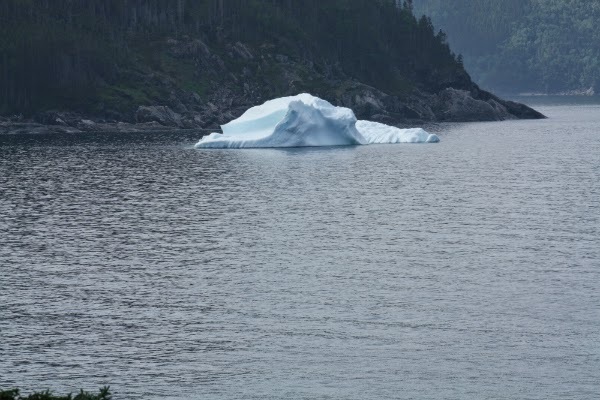 Aside from the beautiful icebergs, we also saw two eagles and a porpoise. It was a great way to spend part of the day. 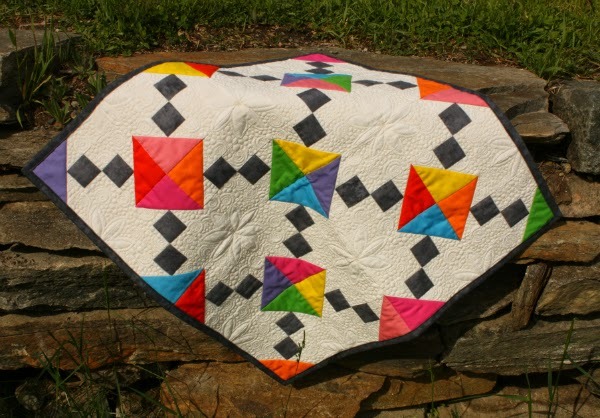 It's week 3 of Plum and June's New Quilt Blogger Blog Hop! Have you been visiting all the wonderful bloggers and leaving comments to say hi? Here's the list of participants for this week, and be sure to come back next week when it's finally my turn! My Spin Placemats pattern is now available in my Craftsy Pattern Store! This pattern is for making four placemats, though it also includes cutting instructions for making only one. My pattern testers both did an awesome job with their placemats. Jasmine, of Quilt Kisses made this fun purple version. Fiona of Celtic Thistle Stitches made a cheery red and aqua version. 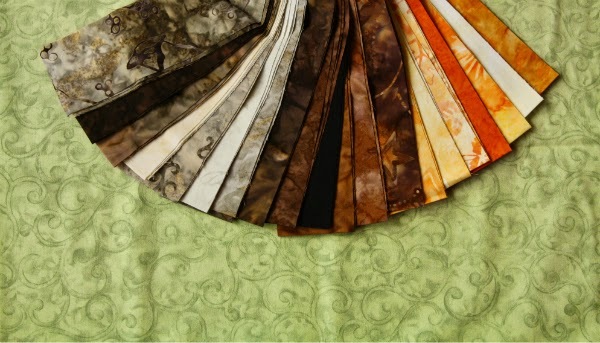 Don't you just love those fabrics? A huge thank you to Jasmine and Fiona for checking this pattern over for me. I really appreciate your help and your suggestions, ladies.